Every household in rural India will have a toilet soon—though the state of such toilets may be debated. Hundred per cent toilet coverage in households will happen much before the October 2, 2019 deadline. As on April 2018, the number of households not having toilets is just 27.8 million. By March 2019, all these households will have toilets, if the current pace of construction sustains. The household toilet coverage in India has increased steadily since Swachh Bharat Mission (SBM) was launched in October 2014 by Prime Minister Narendra Modi, setting October 2019 as the deadline. The day marks 150th birth anniversary of Mahatma Gandhi. The rate of toilet construction in 2015-16 increased 2.2 times as compared to 2014-15. In the next financial year, the rate increased by 1.7 times, and again in 2016-17, it increased by 1.4 times. If, in 2018-19, the rate of construction increases by at least 1.4 times that of 2017-18, then all the households in rural India will be covered by December 2018. The 2015-16 household coverage was almost 50 per cent, which increased by 14 per cent in 2016-17 and 19 per cent in 2017-18. 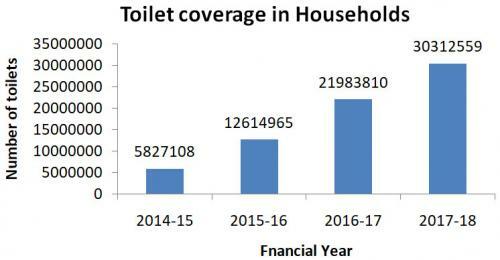 Thus, the household toilet coverage, which was just 62 per cent in June 2017, reached 83 per cent in April 2018. Is it the number which India is looking at for meeting SDG? Recently, we are witnessing a competition between districts across the country to set a record for construction of toilets at the shortest possible time. Prakasam in Andhra Pradesh has topped the list till date, constructing around 30,000 toilets in two days. But there is state-level record set by Uttar Pradesh, constructing around 352,000 toilets in just 17 days. Recently, even the laggard states—Bihar, Odisha and Uttar Pradesh—have covered a lot of ground. In just 10 months, 6.5 million toilets were constructed in Bihar, 5.3 million toilets and 1.5 million toilets in Uttar Pradesh and Odisha, respectively. Thus, the rate of construction in Bihar, Uttar Pradesh and Odisha in the last 10 months was approximately 15 toilets, 12 toilets and four toilets per minute, respectively. Such construction spree makes one wonder whether the whole idea of SBM is just about having toilet in every household. Considering that all the toilets are functional with 100 per cent usage, question still occurs whether the sanitation is at all safe. According to a 2017 report of the Joint Monitoring Programme (JMP) of the UNICEF and WHO, the proportion of Indian rural population having toilet coverage is always more than the safely managed sanitation facilities. By 2015, India had missed the target of reducing number of people without sustainable access to basic sanitation by 50 per cent—under Millennium Development Goal (MDG) No 7—by a wide margin. The MDGs have now been replaced by SDGs, setting a goal to ensure ‘availability and sustainable management of water and sanitation for all’ by 2030. According to the target 6.2 of SDG, excreta are considered to be safely managed if they receive at least some basic level of treatment. 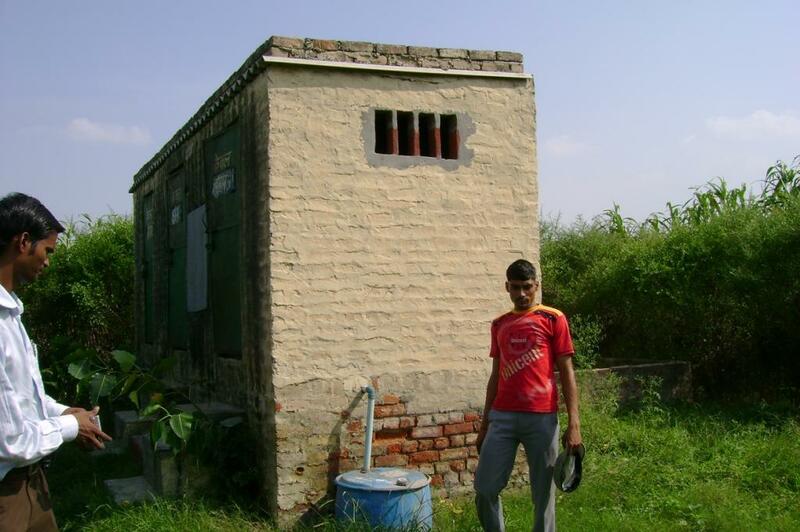 According to 2015 data of JMP, 30.5 per cent of sanitation in rural India is safely managed, although the toilet coverage at that point of time was 44.4 per cent. The states are yet to spend on solid liquid waste management (SLWM), which is a major part of safe sanitation. According to MDWS report in June 2017, over 90 per cent of the expenditure is on hardware. Only Rs 39 crore was spent across the country on SLWM in FY 2015-16. This increased to Rs 73 crore in FY 2016-17. In FY 2017-18, till January 15, 2018, Rs 79 crore was spent, says a 2018 report by Centre for Policy Research, a Delhi-based public policy think tank. Not only India, African countries are also trying to get rid of the open defecation tag at the cost of unimproved sanitation. A common trend observed in many African countries, which showed such improvement, is ending open defecation by replacing it with rudimentary or traditional toilets. Hence, the region is in a dire need of a sustainable solution for management of liquid waste. The UN report of 2014 said that among 1 billion open defecators in the world, 60 per cent are from India and the rest are in Central Asia and Sub-Saharan Africa. If such is the case, then meeting SDG will depend on how countries in these regions move towards safe sanitation to attain a clean state by 2030.